I first got a taste of Brno in 1995. Back then, one of the most popular "Italian" dining options was a slice of pizza with a squirt of ketchup, served through a tiny window on Česká street. You can still get it there today. Even so, eating out in the Czech Republic's second city has come a long way since my first visit. 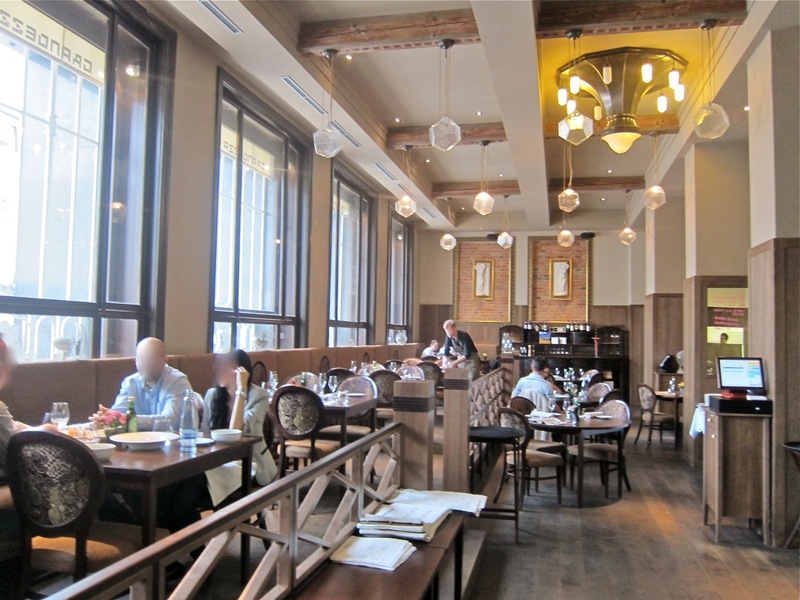 Fine dining establishments have slowly and sporadically sprouted up over the years. 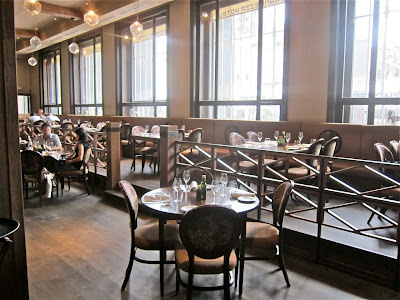 Several years ago, I surveyed the scene and sampled Borgo Agnese, Ristorante Rialto, Noem Arch and many others, a few of which have disappeared. But a new crop of restaurants have been making names for themselves. There's Pavillon, a modern-looking eatery by the much-lauded team behind U Kastelána. And the sushi restaurant Koishi was voted the sixth best restaurant in the country in Maurer's Grand Restaurant Guide for 2012. Now Riccardo Lucque, Prague's purveyor of top Italian fare and the creator of Aromi and La Finestra in Cucina has opened a restaurant in Brno. It is Il Mercato, located on the Zelný Trh (Vegetable Market) in the center of town. 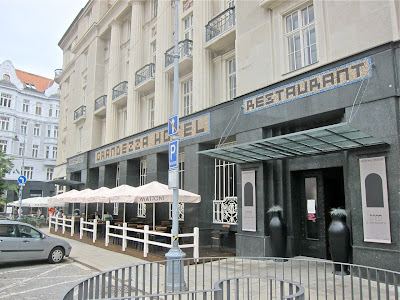 It's in a historic building that also houses the Grandezza Hotel. Dining outside is an option in the warmer months. But the inside may also give you a warm feeling. The dining room is light and long. Large windows let the sun stream in during the day. Exposed brick, beautiful wood flooring, and ceiling beams, give the new restaurant a comfortable, lived in feeling. There's also an open kitchen. Like Aromi, there's a table with cheeses, olives, hams, and a wide selection of grappas. The restaurant is dog-friendly. A golden retriever slept peacefully under another table. We stopped in for a late lunch. Hearing lively tunes by Mina playing over the sound system quickly brought smiles to our faces. Our waiter quickly brought us basket with light and dark bread, bread sticks, and crunchy, spicy chickpeas. 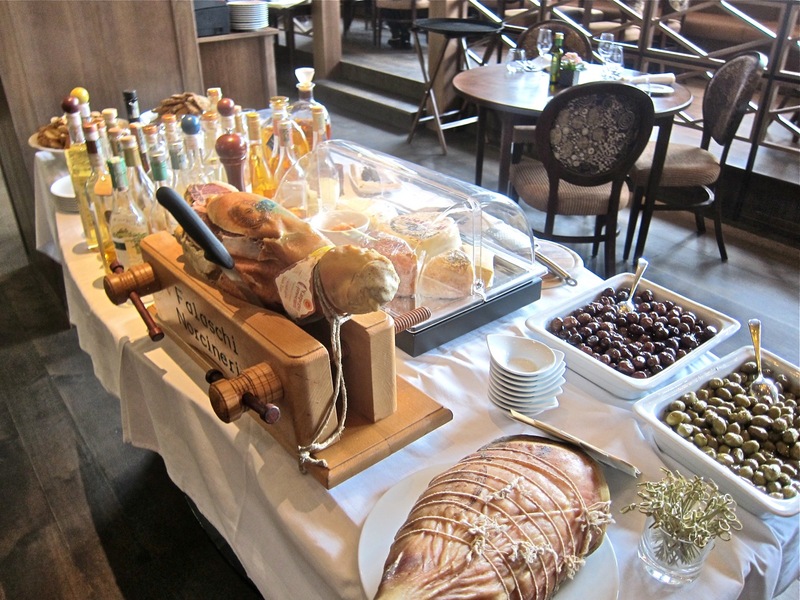 The bread is good, but the slices they serve at Lucque's Prague restaurants are better. 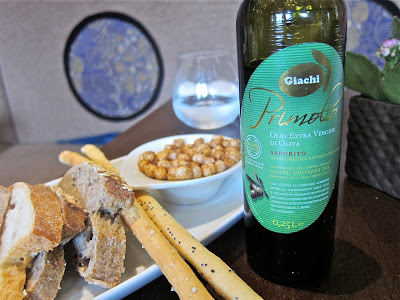 What we really loved was the Giachi primolio extra virgin olive oil. The olives are picked in the first ten days of November, the oil has low acidity and really presents the essence of the fruit. 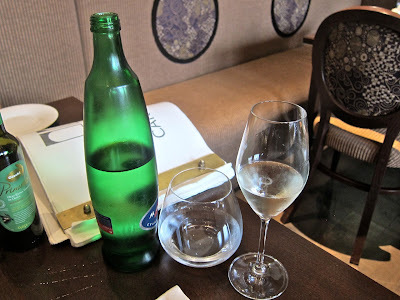 To go with that we had a large bottle of Mattoni mineral water (90 CZK) and a glass of Ruggieri Prosecco (110 CZK). Then, Miss P had the starter portion of the porcini mushroom risotto (295 CZK). This was a daily special. Although looser, with more liquid than some versions, it was an absolutely creamy, delicious delight. 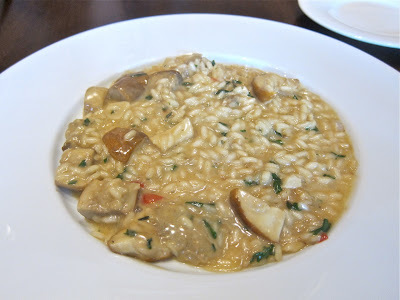 It burst with porcini flavor with undertones of white wine, the rice was cooked perfectly, and the fresh leaf parsley accented it at just the right moments. I had the scallops with smoked aubergines and Bernaise sauce (295 CZK). The photo does not give the proper perspective -- these three scallops were the largest and plumpest I've seen in a long time. They were lightly seared, with light brown crusts on top and the most delicate, almost gelatinous interior. The sweet aubergine had just a hint of smoke. 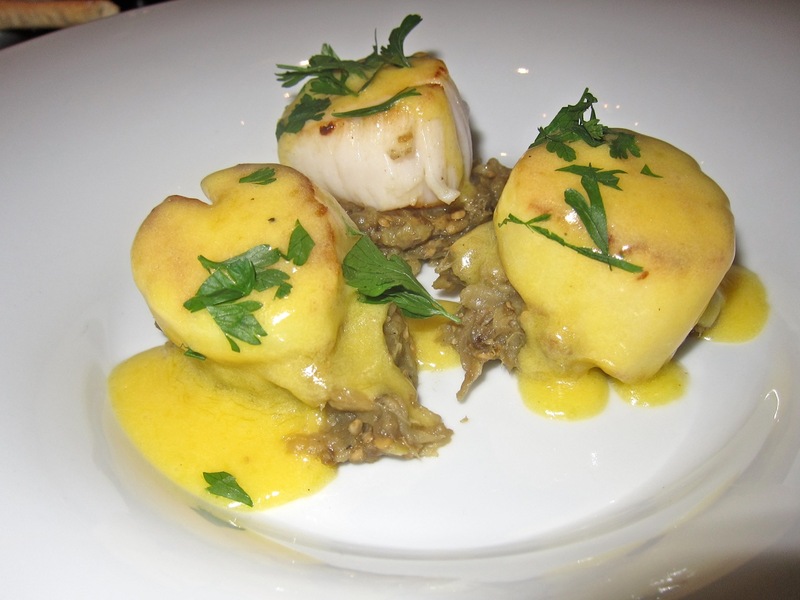 The egg yolk, clarified butter and herbs of the sauce sent it into the realm of decadence. Amazing. There was a noticeably long pause between courses. Only three other tables were occupied in the late afternoon, so I'm not sure what caused the delay. 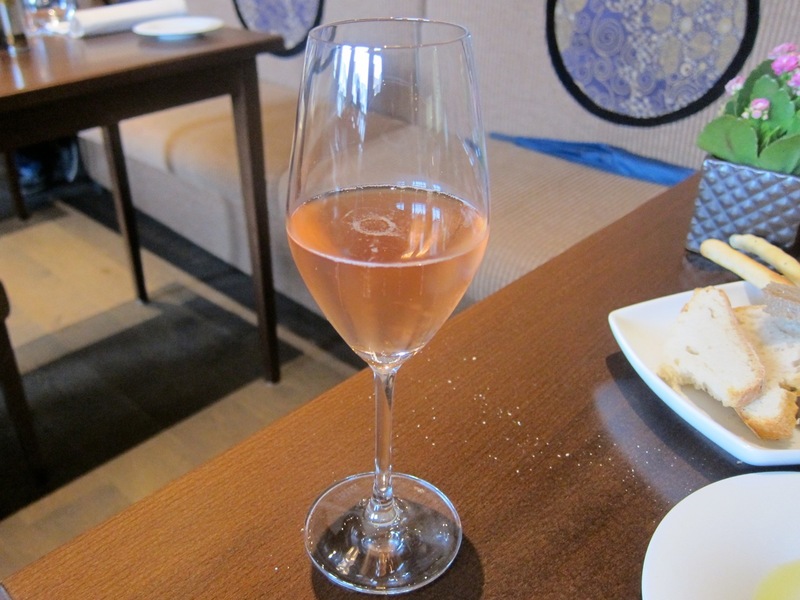 Miss P had a glass of Nino Franco brut rosé "Faive" (130 CZK). This was fine, but not as complex and enjoyable as the Berlucchi '61 Franciacorta rosé we enjoyed at Aromi. 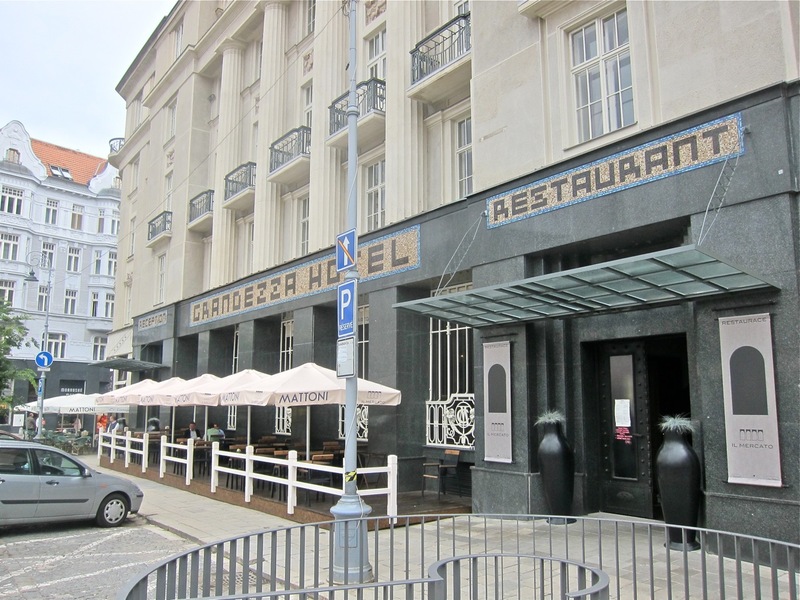 From the secondi, Miss P had the grilled octopus (395 CZK). These were the best tentacles I've tasted since the great ones I had at Divinis Wine Bar a couple of years ago. But this version was even better. 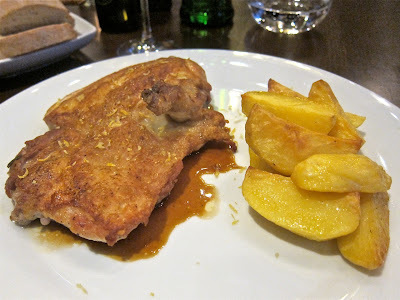 The lovely char on the outside gave it a smoky, crunchy exterior that gave way to an almost impossibly tender interior. The close up shot makes it look small, but it was a generous portion. 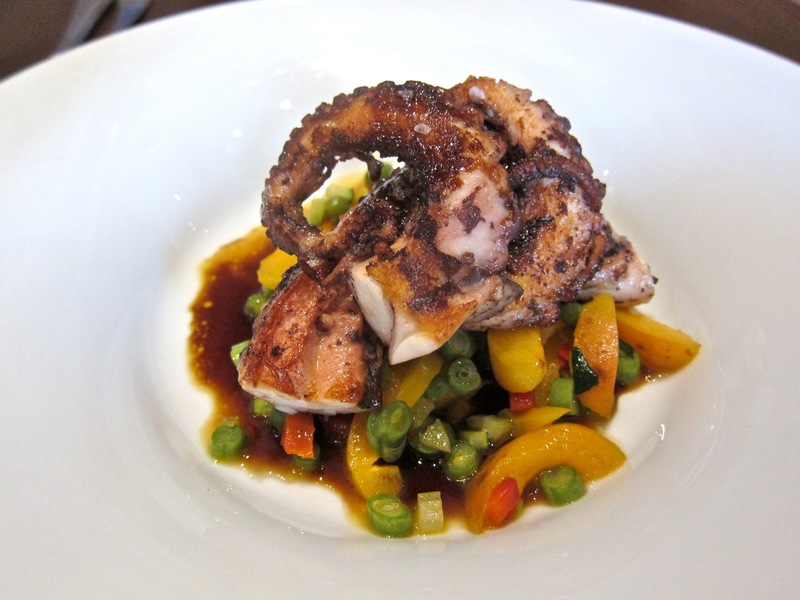 The octopus sat atop a caponata of red pepper, zucchini, green beans, and fresh apricot slices. The juices from the ripe fruit combined enticingly with the reduced red wine underneath. I got a starter-size risotto as my main course -- the risotto alla Milanese (225 CZK). 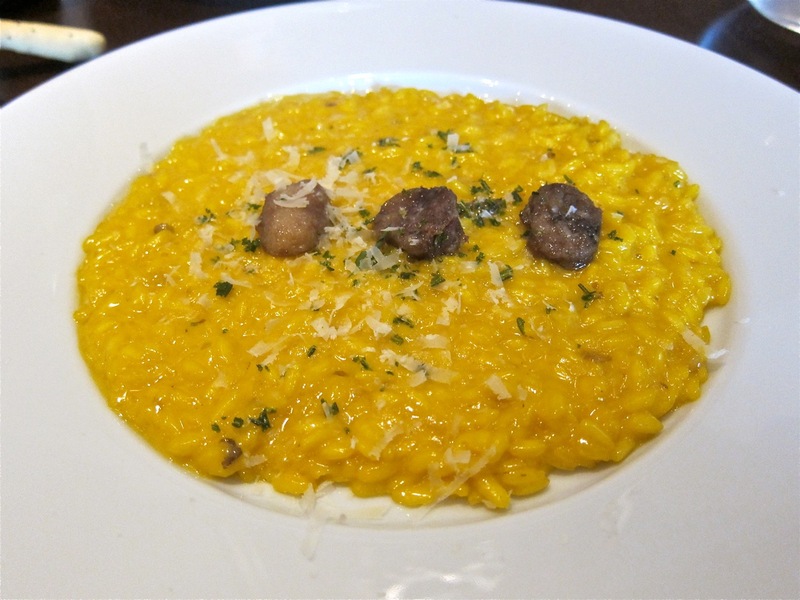 Each bite of the al dente rice was a saffron-infused pleasure. Crispy slices of beef bone marrow lay on top. Each piece melted in the mouth. There was added tang from the freshly grated Parmesan on top. I wanted that dish to last forever, but there was some consolation when it was time for dessert. I went for the profiteroles filled with hazelnut crème Chantilly (175 CZK). The Chantilly inside the pastry balls tasted like the best hazelnut gelato I've had. 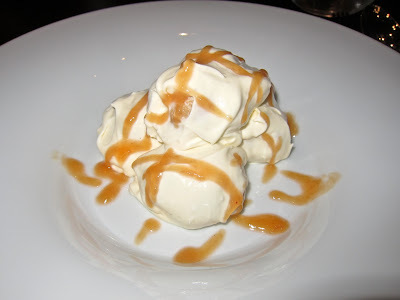 But what made this extra special was that the balls were covered with sweet, creamy mascarpone drizzled with apricot syrup. I was told everything was made on the premises. Miss P ordered the lemon sorbetto. 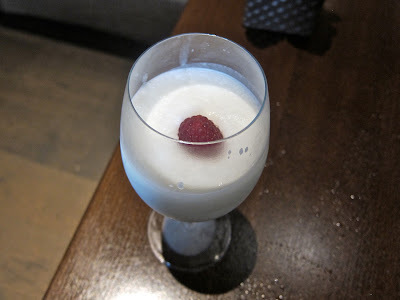 This is a favorite at Aromi, but this version had more Prosecco and lacked the tartness she was looking for. We finished with two cappuccinos (55 CZK each). It's top quality coffee and comes with a dish of cremina, the mix of sugar and a few drops coffee that dissolve more easily in the cup. The tab for this meal was 1920 CZK before tip. We only had one day to spend in Brno so we walked around town, shopped, and had more coffee. And then we went back to Il Mercato for dinner. Unlike lunch, we received an amuse bouche. 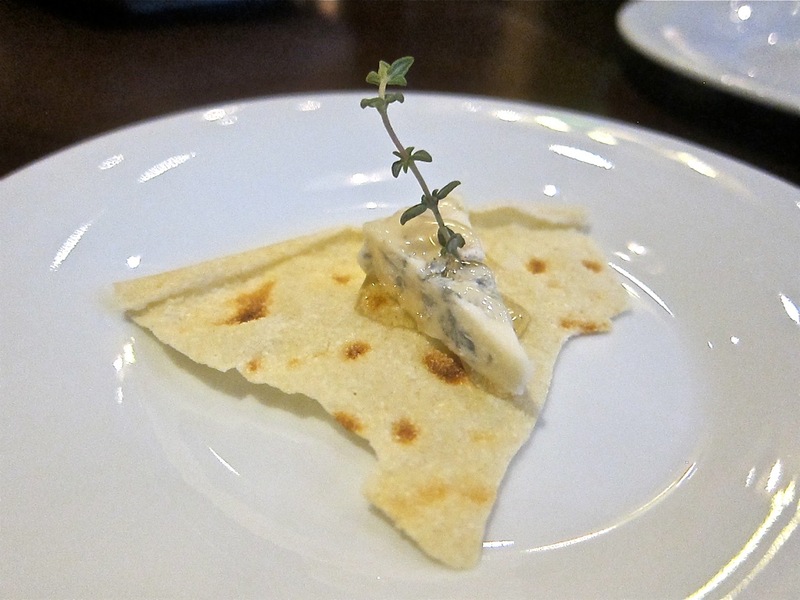 It was tangy Gorgonzola topped with honey on crispy pane carasau. The combination of flavors was so simple and yet such a great combination to start off with. My bouche was amused. 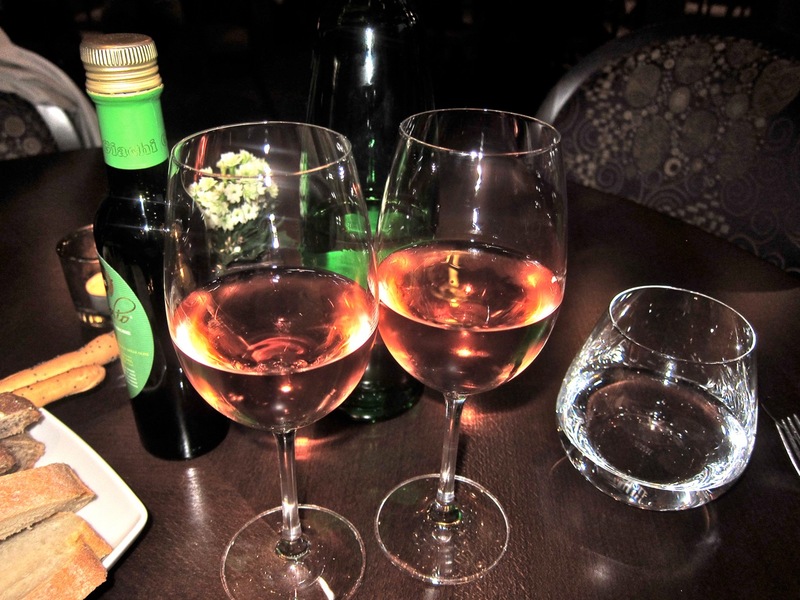 We decided to try a Czech wine, so we had two glasses of rosé Merlot (80 CZK). Given the short time between meals, we weren't so hungry. Miss P had the seared tuna and artichoke salad (195 CZK). 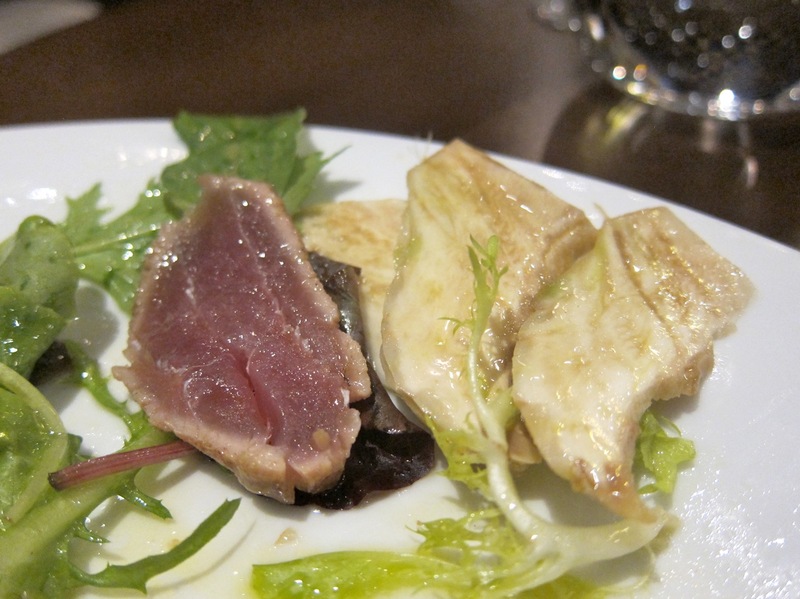 It included radicchio and Romaine lettuce with a light oil and vinegar dressings. She asked if the tuna could be extra rare, but was told the tuna was served rare and already cooked. It was a little more done than she liked, but she still really liked it. But what she loved was the raw, thinly sliced artichoke hearts. The chewy, crunchy, earthy flavor was a taste of her Tuscan youth. "This is the best salad ever," she declared. "Can I have it again?" So she had another one. 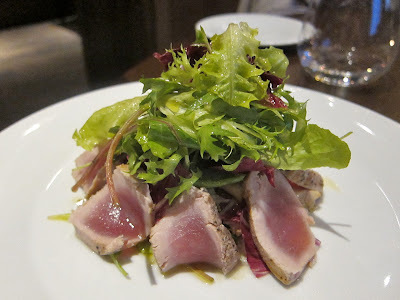 I'm not sure if they seared another tuna based on her previous request, but this one was much more rare. You can also see how these special artichoke hearts looked. I had a hard time deciding what to order because so many dishes sounded good to me. After much deliberation, I choose the grilled organic chicken "diavola" (295 CZK). I picked this because I'd had almost the exact same dish at Lucque's La Bottega di Finestra in Prague. I wanted to compare. The chicken, with most of the bones removed, had the same beautifully crispy skin and moist flesh underneath. However, the sauce was lacking the zing in the version I'd had before. The roasted potatoes in the Brno dish were done right, but I preferred the vinegared potato salad it came with in Prague. 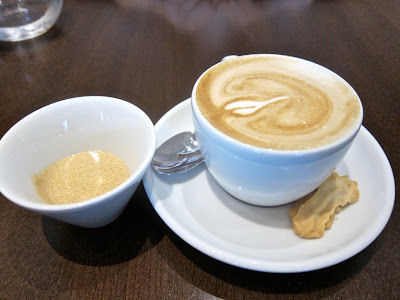 We also had Mattoni with the meal and finished with cappuccinos. This dinner cost 990 CZK before tip. The service was generally efficient and friendly, with only a couple of lapses when our servers left us unattended for too long. The big question is whether it is worth it to pay Prague prices in Brno. My answer is yes, absolutely. The quality and standards are the same. It was a lovely experience. 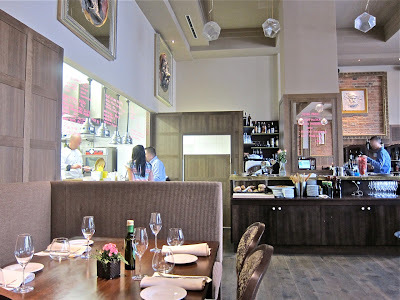 Shortly after opening, Il Mercato has to be one of the best restaurants in the city. I really hope I'll get a chance to return to this market.